If I kept going at that rate I would reliably be up to 300 pounds by summer. I had cholesterol levels that were not good for anybody — much less for someone like me with a family history that looks like a American Heart Association horror anthology of strokes, heart attacks and emergency artery bypass surgeries. A sleep study I took, that had me wired up like Neo in the first Matrix movie, showed I had “severe” sleep apnea. People die of that. Then came the heart attack scare. A full dress rehearsal of the abyss. The scare was this: Although I had no symptoms at all that day, on the trip home from work I had a near-fainting incident that came out of nowhere — and with no immediately clear cause. This sent me to a weekend emergency room visit. Thankfully it was not heart problems but during the several day hospital stay doctors thought it might have been. It was a full “dress rehearsal” for a stepping into the abyss. I could see where this was leading to, and it was a scary place. For a weekend they watched me closely to figure how what the hell just happened, not being entirely sure if I had a “vascular event” — the cold clinical term for heart attack — or not. It was the health equivalent of the vision of the Giant that Agent Cooper would occasionally see in the show Twin Peaks, that would appear in surreal visions warning him of grave danger ahead. I had previously had some success with weight loss, but never more then varying blips or rushes of success for a few months followed by regain when stress, life work swarmed back. In each failed blip though, I would learn a bit more about how to eat healthier, how to plan foods, how to exercise more, but none of the blips lasted more than a few months, tops. I knew HOW to do this, I never got the HOW TO KEEP DOING IT part. But that night, alone in the emergency room, my doctors still worried, I lay awake hearing the machine go “beep, beep, beep” to and being thankful for each beep. I was ready. Ready to “new leaf” my health and to make choices that this time, I would not just do, but — for the best I could — keep doing. I began on January 1st — seemed appropriate a New Years Resolution. At least I would have the company of millions of others resolving for a healthier new year. But in prep for that day, over Christmas I had done some research and had dropped sufficient hints to my spouse for some key tools to help. Geekery — which has always been both a core part of me and at best a mixed blessing — this time would turn out to be a key ally. Because this was not just any January, this was January 2014, and some key health tools had just come into existence for the consumer market that someone like me who is unabashedly a nerd at heart, could grasp onto. Here were they most important tools. And basically there were five. One: a digital, wirelessly networked scale. I had to stop “flying blind” on my weight. So it had to have a scale with the following traits: dead simple to use, track weight precisely but also lean vs fat weight, and sync effortlessly to the cloud. There are a lot of good ones out there. Here is one. Two: Food and exercise tracking App on my phone. Another area I had to stop “flying blind” on was my eating — and in specific my daily calories in versus calories burned. There are a million apps in this space, and I tried them all, but I winnowed it down to apps that can best do this: help me set my needed daily calorie goal, assist me in adding and tracking almost any food within 30 seconds, have a huge a database of foods, and show at a glance how I’m netting out on calories in vs out each day. I settled on two apps I used in combination. One was My Fitness Pal…. MFP has an unrivaled and simple food database, and a good visual for calorie intake vs. burn. I knew I had to start tracking virtually everything I eat and all my steps per day — and I know I will be doing some form of this for the rest of my life. Three: an activity tracking wearable. This tool is all about how to track every single step and movement and nudge you to up your daily activity. I work at a desk, and often have long hours. I’d need something to help me get a handle on how to get more active. Frankly sitting was killing me. Here is what the activity band needed to be: given that you wear it 24/7 it had to be a non-ugly fashion accessory, it had to accurately track steps, it had to wirelessly sync to the cloud, and battery life needed to be one week minimum. All other features were nice but extras. Battery life alone ruled out the Apple Watch. Here too, there was a plethora of choices. I ended up on this one. I wore my first tracker for tracker for one entire week where purposefully I did not do even one extra step than I usually did. I needed to see how I was doing in my “normal” state, and wow — what a sedentary panda-like creature I turned out to have been. I was only clocking in at about 2,000 steps at most during a normal day. The tracker helped me see my progress as I slowly tried to ratchet things up from there. The more I did the more it “earned me back” some calories each day in my quest for my daily net calories goal. Four: Trend based weight tracking tools. Although all the apps had some version of this, the best one I found was an online only website, Trendweight. It’s created by a web developer who built it for himself first, he got it right for all of us. It works with both the FitBit Aria Scale or a Withings WiFi Scale, and it automatically syncs to both web services to plot a moving average from your daily weight alongside your daily scale weight. Invaluable. So I would weigh in daily but frankly not care about the daily data. Each days weigh in was purely valuable as one more data point helping form the trend line. Lastly: Community online: It was important to have a community, but also that I didn’t push this in-front of all my friends, “spamming” them with the ups and downs of this effort. Here places like Reddit’s Loseit, NerdFitness, Facebook Groups for others trying to get fit, and others. I took some wisdom from Jerry Seinfeld’s advice as to how to build long term goals: set a few simple daily tasks, track daily and then think of each day as a link in the chain. For me, each day’s heath chain link was: eat a net total of 1,600 calories, get 10,000 steps minimum, get 7 hours of sleep or more. Longer term goals would take care of themselves. Just do your best to not “break the chain” that day. And when you did break it, don’t freak out, but just start the chain back up. It was that simple, and that hard. Link after link after link. And for the first 7 months of loss not one person but me could tell. 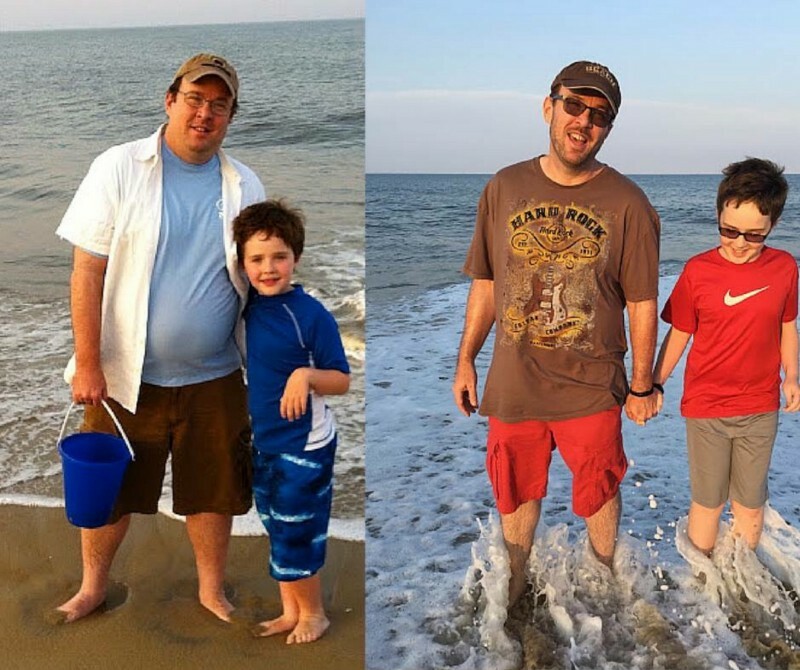 But over 25 months, bit by bit I lost over 110 pounds. I dropped five suit sizes, and most importantly, my doctor is happy with my cholesterol tests and blood pressure. And I’ve been approved to ditch the sleep apnea mask. ONE: Trust the “signal” of the trendline, ignore the “noise” of the day to day flux. Care about the trend, the core average direction and ignore both odd spikes and big short term drops. This is not a straight line. There are victories and defeats but don’t stress. Watch the direction, watch the pattern. Like Nate Silver and others aggregating political polls day to day into one “metascore” of aggregated polls, what matters is this core line. TWO: The aphorism, “You can’t outrun your fork” is true. Don’t try to. Exercise is a distant second to eating clean in tema of its effect on weight loss. About 10–20 percent of weight loss is exercise at most, and by contrast about 80–90 percent of success in weight loss is nutrition. You simply can’t out-exercise a bad diet, you can’t burn off enough calories to make up for eating poorly or too much. There are a million other health reasons to exercise daily, but for weight loss, if something has to give, triage to eat healthy and miss the mark on exercise for the day. Then pick both back up. THREE: Trust math and play a long game. Health is all about “compound interest” of thousands of healthy acts. Each step counts, each food choice counts. For the first six months I could not break 6,000 steps a day no matter how hard I tried. Then bit by bit, to a 13,000 a day target that was pretty doable and normal. Getting healthy is not about a Herculean sprint, it’s about dozens (hundreds?) of small healthy choice per day, for life. It’s about choosing to walk back from the client meeting to work in 15 minutes for free — versus Ubering it in 10 minutes paying $8 bucks. It’s about striving to not break the chain of good habits — and restarting when you do. It’s about striving to hit your daily step goal every day, that somehow adds up to millions of steps over time. It’s just like compound interest of all these acts adding up. And the simple math of caloric intake and caloric burn works over time, trust it. Especially during plateaus, or spikes of weight gain, patiently trust that if you just stick to the system, keep not breaking the chain, you can rest assured that in the the long run the math will work. That’s what math does. FOUR: Open data is dramatically better than closed. It was critical that my apps could speak to each other and to the cloud, not just to what companies each toolmaker had deals with. My web-based trend tools needed to talk with my scale which needed to speak to my phone. We work so hard for the health data about steps, weight, fat percentage, etc, that should be our data open to use with whatever tools we wish. Not all vendors treat it as such. For instance, I actually stopped using the FitBit band and platform, and moved to the Jawbone UP platform because of the Jawbone choice to support for the more open Apple HealthKit integration, and chose a more open data policy, and FitBit’s chose not to support either. LASTLY: I learned the bigger lesson that an intentionally active life is the best kind of life. Now that I have this as more of lifestyle engrained two year habit, I just KNOW that each day I am up for getting at least 13,000 steps of activity somewhere. So get that activity in the richest, least boring, most fun way possible. Just like you should avoid “empty calories” in foods where you can, avoid “empty burned calories” where you can. So just like some foods have “empty calories” that are calories but not particularly good for you nutritionally, just so I would focus on avoiding “empty burned calories” which so many hours spent on a treadmill were. Burn your calories wisely and well. Look 10,000 steps on a treadmill is better than not doing them all. But far better still was 10,000 steps exploring new DC neighborhoods near my work, 10,000 steps through museums or malls, 10,000 steps hiking around lakes and through forests trails. Or even 10,000 steps doing chores — where at least there in exchange for burned calories, I get vacuumed floors or a cleaned up garage. But however you do it: it reminded me the truth that a calorie is not a unit of fat it is a unit of energy . Technically a food calorie is what is called a “kilocalorie,” which is the amount of energy needed to raise 1 gram of water from 15 to 16 °C. It’s about action. And every day’s calories are best seen as a set of potential energy to be spent. So do it in the best way. And life is really meant to be actively lived, and that is much more richly done exploring, climbing, running and zooming through it, not just sitting through it as goes by around you like a parade you aren’t actually in. My challenges now: how to keep this going after no longer striving to lose anymore. I’m where I need to be today in weight. Now it’s about how to cement this into the rest of my life, permanently and for good.